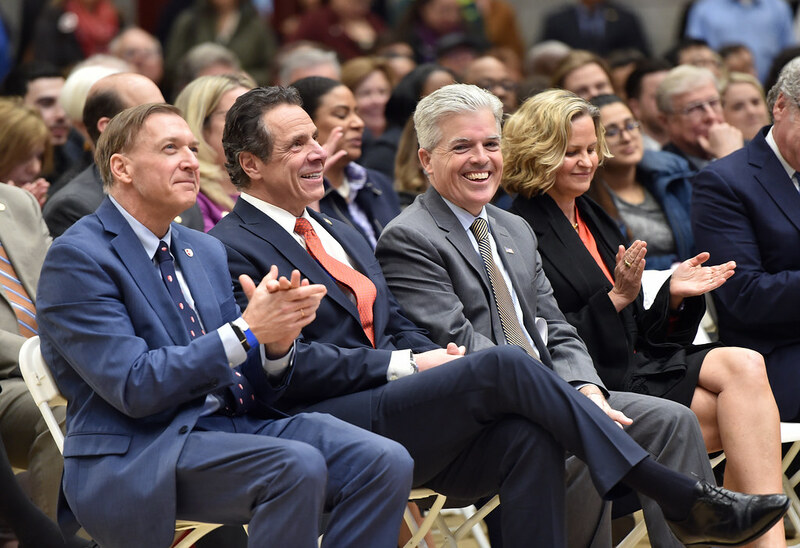 "This year's budget builds on our progress and our momentum on Long Island and it includes $18 billion for Long Island—the largest amount of money the state has ever brought back to the region and we're proud of it," Governor Cuomo said. "The arrow is pointed in the right direction, we have more jobs on Long Island than we have ever had in history, and taxes are down all across the board. Everything is in the right direction, we just have to keep it going. We have the plan, we are executing the plan and we are working together as one Long Island with a future brighter than ever." Senate Majority Leader Andrea Stewart-Cousins said, "Making the property tax cap permanent will benefit home and business owners across New York State and save taxpayers almost $190 billion over the next decade. Our new Senate Democratic Majority passed a permanent property tax cap early this Legislative Session and included this important priority in our One House Budget Resolution. I am pleased that the final state budget makes the property tax cap permanent and that the Senate Democratic Majority voted unanimously for this historic accomplishment. I look forward to continuing to work to deliver meaningful tax relief for hardworking New Yorkers." Assembly Speaker Carl Heastie said, "The Assembly Majority is committed to putting families first and meeting the needs of our most vulnerable populations on Long Island and across the state. Despite the financial challenges we are facing, in this year's budget we made critical investments in our future, increasing education aid by $1 billion, and creating more affordable paths to higher education. We restored funding for Medicare and Medicaid, so every New Yorker has access to the vital services they need. We protected our waterways and environment by banning plastic bags and investing $500 million in clean water infrastructure projects. I look forward to building on the progress we have made to continue moving New York State forward." Senator John Brooks said, "I am proud that we in the New York Senate were able to work so closely with Governor Cuomo in delivering a state budget that brings substantial benefits to Long Island. However, I fully recognize the necessity for a continued effort to alleviate the extensive residential property tax burden suffered across the state in order to fund education. We must also be aware that in this budget season we had to account for new federal tax laws that have negatively affected our middle class and as a result are sending an added $15 billion to the federal government. Yet thanks to our relationship with the Governor we were able to increase funding for education, address many environmental concerns, and establish methods to provide for much needed funding for our decaying Mass Transit systems." Senator James Gaughran said, "I am proud that the new State Budget will provide a record amount of funding for Long Island's public schools, as part of a $1 billion increase statewide. The budget prioritizes our environment with $500 million for clean water infrastructure to support clean, safe drinking water. I thank Governor Cuomo for investing in Long Island's public schools, environmental protection efforts, and our economy." Senator Anna M. Kaplan said, "It was a difficult budget year, with revenues down as a result of the Federal Government's assault on New York taxpayers, but I'm proud to have stood with our Governor Andrew M. Cuomo to pass an on-time a budget that delivers for Long Island residents. By working together, we succeeded at delivering record funding for our schools, making the property tax cap permanent, reducing the local tax burden, reforming the MTA and LIRR, protecting the environment, and fighting the crisis of addiction. And, by keeping spending under the 2% cap, this budget balances the need for fiscal responsibility, while still affirming our values, and that is something about which we can all be proud." Senator Monica R. Martinez said, "Despite this being a difficult fiscal year, I am proud to have delivered record school funding for the educational programs and initiatives that our students need and deserve. The adopted budget includes increases to education aid by over $1 Billion, with $34 million of those dollars going directly to schools in the Third District. Additionally, we were able to include $475k for professional administrative development and $250,000 for the Long Island Pre-Kindergarten Technical Assistance Center, which will provide the necessary tools for educators to foster a productive and healthy educational environment for our preschool aged children. We must continue to increase our commitment to each child by providing schools with the crucial funds they need to provide a quality education that will allow their students to succeed and prosper." Senator Kevin Thomas said, "I commend Governor Cuomo for his leadership in passing a State Budget that invests in economic growth and improved quality of life for all Long Islanders. Together, we have secured record funding to support our infrastructure, transit systems, environment, and education. The inclusion of a permanent property tax cap will save Long Island taxpayers billions, and much-needed student loan regulations will ease the financial burden that thousands of New Yorkers take on each year while trying to further their education. I am proud to stand with Governor Cuomo as we work to deliver a bright future for Long Island." Assembly Member Anthony D'Urso said, "I was happy that this budget cares for our most vulnerable and holds true to create a fairer, more just state for all, where opportunity and success are not reserved only for the lucky few. We were able to Increase fairness in our criminal justice system as well as increased funding for public schools protecting the environment and made the 2% property tax cap permeant. We also passed early voting and to modernize our voting system. I am happy that the 2019-20 state budget builds on the historic progress that's already been made this year and stays true to the commitment to putting families first." Assembly Member Steve Englebright said, "Governor Cuomo's presentation was uplifting. It was also a preview of the future of Long Island as an indelibly important part of the state that the Governor and Legislature appreciate and are continuing to invest into. The Governor's message was reassuring for continuation of our regional quality of life." Assembly Member Judy Griffin said, "This year's state budget helped make Long Island more affordable with a permanent tax cap, restoration to local municipalities, provided a record amount of school aid, prioritized funding for the LIRR, and took action to protect our environment. I applaud Governor Cuomo for making Long Island a priority and ensuring that Long Islanders stay on Long Island." Assembly Member Charles Lavine said, "The state budget encompasses many great items that will have a positive impact on the economy and provide for a bright and prosperous future." Assembly Member Kim Jean Pierre said, "In a fiscally-challenging year, I am proud of what we were able to achieve in this year's budget, particularly for Long Islanders. Working together with Governor Cuomo, we passed an on-time budget with investments and measures vital to Long Island communities, including more funding for local schools, more affordable child care options for families, and a permanent property tax cap to provide critical relief to our residents. I look forward to continuing to work with Governor Cuomo to ensure that Long Island always receives its fair share." Assembly Member Taylor Raynor said, "When childcare and quality education is not accessible, it can cripple economic development. When there is no economic development there is poverty. Where there is poverty there is crime. This year's budget season was intense but I am happy to report that we have record school funding increases, funding to support childcare, funding to address our water infrastructure and funding to make improvements to the LIRR. Ever Upward." Suffolk County Executive Steve Bellone said, "The Governor made a promise to Long Islanders that he would make the property tax cap permanent - and he kept that promise. For the last nine years, Governor Cuomo has shown an ability to get things done when the critics would suggest otherwise. Whether it's rebuilding the Long Island Rail Road or making historic investments in sewer infrastructure, the best is yet to come." Nassau County Executive Laura Curran said, "I'm thankful for Governor Cuomo's unwavering commitment to Long Island families, as demonstrated by an on-time budget that supports Nassau taxpayers and provides much needed investment in our transportation infrastructure. I especially thank the Governor, Senate, and Assembly for passing my Taxpayer Protection Plan, which will give Nassau residents a five-year phase-in on changes in taxes due to the county's first reassessment in nearly a decade. I was elected to fix the County's broken assessment system and with Governor Cuomo's support, we are both protecting county residents and restoring fairness and accuracy." This year's budget builds on our progress and our momentum on Long Island and it includes $18 billion for Long Island—the largest amount of money the state has ever brought back to the region. CHIPS Local Highway Aid Program: The Budget provides $40.1 million in funding for local roads and bridges in Long Island through the CHIPS program. PAVE NY Local Highway Aid Program: The Budget provides $9.2 million in funding for local roads in Long Island through the PAVE NY program. Transit Operating Aid: The Budget provides $74.4 million in funding to Nassau County and $29.4 million to Suffolk County in FY 2020, increases of $5 million and almost $2 million from FY 2019, respectively. The Budget also provides nearly $3 billion in on-budget funding to the MTA in FY 2020. This includes aid to commuter rail systems. Invests in Transformative Projects: The Executive Budget includes $100 million from existing capital resources for transformative projects on Long Island, including $40 million for additional investments at the Nassau Hub. $50,000 for the Joint Bellerose Business District Development Corporation. $1 Billion Education Aid Increase: Over 70 percent of this year's increase goes to high-need school districts, and brings the total education funding to $27.9 billion. The FY 2020 Budget increases School Aid in Long Island by $124.6 million, including a $48 million increase in Foundation Aid, for a total increase of 3.9 percent. Free Tuition at Public Colleges: Approximately 40% or more than 26,100 undergraduate fulltime resident students enrolled in public colleges from Long Island attend tuition free through the Excelsior Scholarship along with other sources of student financial assistance including the generous Tuition Assistance Program (TAP). Stop the MS-13 Gang Recruitment Pipeline and Improve Youth Opportunities: To ensure young New Yorkers have the resources to avoid gang involvement and law enforcement agencies have the tools to combat gangs, the FY 2020 Enacted Budget is continuing over $45 million this year to implement the bold, comprehensive vision laid out over the past year to eradicate MS-13. Additionally, the State will fund violence prevention grants, build school-based supports, and improve State Park programming, as well as enhance law enforcement intelligence and analysis capabilities. These new programs will complement existing investments in both social services and public safety, building an array of resources to dismantle the immigration to victimization pipeline. Statewide Health Care Facility Transformation Program II (Enacted FY 2018). Long Island has been awarded $33.2 million in grants. Neighborhood and Rural Preservation Programs: The Enacted Budget includes nearly $1 million for the Neighborhood Preservation Program (NPP) and Rural Preservation Program (RPP) to support community-based not-for-profit groups that provide housing assistance, community renewal activities, and rental subsidies in the Long Island region. Supports Local Governments: Maintains $26.3 million in support for Long Island municipalities through the Aid and Incentives for Municipalities program and other revenue sharing. Maintains Citizen Empowerment Tax Credit: Maintains $1 million in Citizen Empowerment Tax Credits for one village dissolution. Nassau County Reassessment Property Tax Exemption: The Budget authorizes Nassau County to create an exemption to phase-in assessment and tax bill increases over a five-year period for properties that would be facing such increases with the enforcement of the upcoming 2020-21 assessment roll. Support for Sagaponack: Provides $2,000 in funding to the Village of Sagaponack. Renews Record Funding for the Environmental Protection Fund: The Enacted Budget includes $300 million for the EPF, the highest level of funding in the program's history. Appropriations include $38 million for solid waste programs, $88 million for parks and recreation, $153 million for open space programs, and $21 million for the climate change mitigation and adaptation program.